I always like a theme especially when it comes to choosing cookies to bake for the holidays. One year, it was pretty sandwich cookies, and last year, it was swirl cookies. I think this year the theme became classic cookies I’d never baked before. 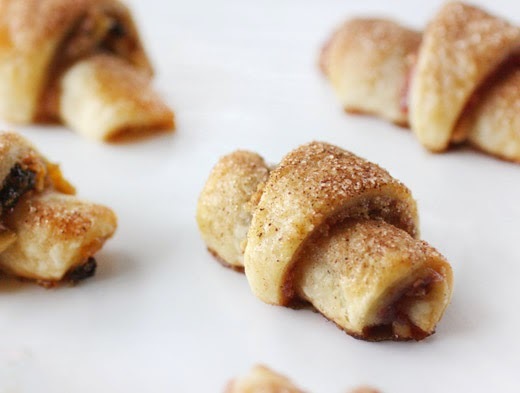 It started with the Linzer Cookies, and then I really wanted to try making Rugelach for the first time. 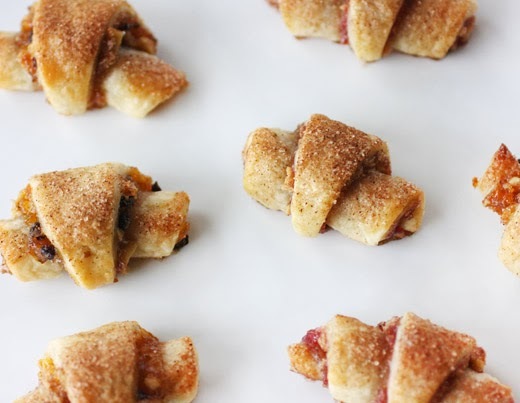 I’d seen the Barefoot Contessa episode in which Ina makes Rugelach several times, so I wanted to use her recipe. It’s in her book Barefoot Contessa Parties! , and it’s also available online. I knew rolling up the little cookies from the wide end of a wedge to the point, just like rolling croissants, would be fun. I went with a classic filling of apricot preserves, chopped toasted walnuts, and currants for half of the cookies. The other half were filled with raspberry preserves and walnuts. These are great cookies to bake as needed just before serving. I filled, cut, and rolled all of the cookies and stored several of them in the freezer. Then, I baked some for dessert for a dinner with Kurt's parents, some a few days later for a party, and more when a cookie craving hit. With the tender, golden pastry encasing fruity preserves and nuts, they’re like little bites of pie in cookie form. First, the dough should be made in advance and chilled. Softened cream cheese and butter were creamed with sugar and vanilla before flour was added. This makes a sticky dough, but it’s much easier to handle after it’s been chilled. It was divided into four pieces that were each wrapped in plastic, and I left them in the refrigerator overnight. The next day, the dough was rolled out on a floured surface into a nine- or ten-inch circle. Apricot preserves were pulsed in the food processor until smooth. Some preserves were spread on the dough circle and topped with chopped, toasted walnuts, currants, and a mix of granulated sugar, brown sugar, and cinnamon. The filling was lightly pressed into the dough before the circle was cut into twelve wedges. Next came the fun part. Each wedge was rolled into a cute cookie with the point of the wedge neatly tucked under the bottom edge. For half of the dough, I used raspberry preserves, that had been strained to remove the seeds, and chopped walnuts. Before baking, the cookies were brushed with egg wash and sprinkled with cinnamon sugar. I love finally attempting classic cookies like these. Now I know what a delight they are to make and how delicious they are warm from the oven. I have more holiday cooking that I can’t wait to tell you about, and I’m trying to decide what to make for New Year’s. I hope you’re having a great holiday season with lots of fabulous food! It’s holiday time, the weather is nice and cool, and the book Winter Cocktails is fitting nicely into this state of affairs. As I started looking at my review copy of the book, I marked pages of each cocktail I wanted to try. Then, I realized I was just marking every single page. The Rosy Cheek is a Winter White Hot Chocolate made with steeped macadamia nuts, crushed pink peppercorns, and lemon juice for brightness. The Cup of Thai is warm coconut milk flavored with lemongrass, ginger, and lime peel and spiked with rum. The Nutella Melt is hot chocolate with Nutella melted into it and added hazelnut liqueur with a garnish of espresso-flavored whipped cream and chopped hazelnuts. There’s also Classic Eggnog, Pumpkin-Bourbon Eggnog, and Butterscotch Eggnog. I want to curl up on the couch and sip these concoctions one after the next. And, these options are just from the chapters for Hot Toddies and Mulled Drinks and Eggnog, Hot Chocolate, Coffee and Tea. There are also Punches and Pitchers and Chilled Winter Cocktails as well as a chapter for infused liquors and syrups and one for snacks to go with the cocktails. I couldn’t decide where to start with the hot chocolate and eggnog options, so first I opted for Liquid Gold: Pineapple Juice, Spiced and Spirited. 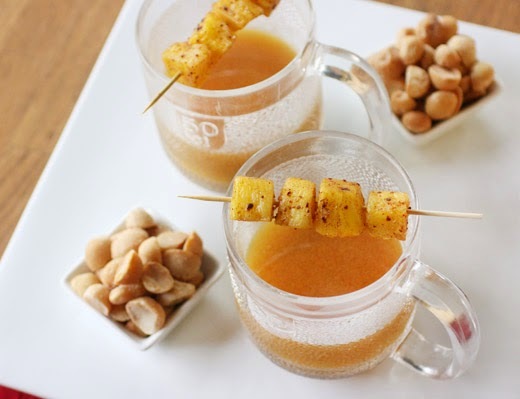 I’d never thought of making a warm, mulled cocktail with pineapple juice, but I loved the idea. Tropical fruits are always a good antidote to cold weather, and it was unusually cold here. To start, fresh pineapple was cubed and seasoned with sugar, Aleppo pepper, cinnamon, and salt. Then, it was broiled for a few minutes per side until slightly caramelized. The pineapple was set aside until cool and then skewered on picks. For the drink itself, allspice berries, peppercorns, whole cloves, and cinnamon sticks were warmed in a saucepan before pineapple juice, rum, brandy, and a scraped vanilla bean and seeds were added. It was left to simmer for about 15 minutes before being poured through a sieve for serving. The mulled juice smelled as lovely while it simmered as it tasted in the mug. Warm spices with sweet pineapple juice mixed well with brandy and rum. And, the spiciness of the caramelized pineapple chunks was a good contrast to the sweet flavors. I served some toasted macadamia nuts with the cocktails and imagined a view of sand and surf and tall, swaying palm trees. Mele Kalikimaka! Recipe reprinted with publisher's permission from Winter Cocktails . Though it calls to mind a tropical setting, the pineapple is in fact a winter fruit. It is also an iconic symbol of hospitality. Warm your home and your friends with this mulled pineapple drink that showcases both its sweet and tart flavors. *Piquant and vibrant, Aleppo is a type of crushed red pepper native to Syria. It is available at specialty markets. For the Pineapple Garnish: Adjust an oven rack to the middle position and preheat broiler. 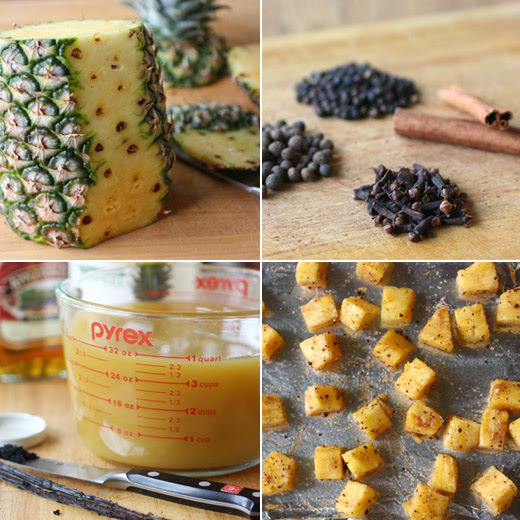 Line a baking sheet with foil and arrange pineapple cubes in a single layer. Combine sugar, Aleppo pepper, ground cinnamon, and salt in a small bowl. Sprinkle pineapple cubes with sugar mixture and toss to coat evenly. Rearrange pineapple in a single layer and broil until caramelized, 2 to 4 minutes. Transfer tray to cooling rack. When cool enough to handle, skewer at least 3 pineapple cubes onto each of 4 short skewers or sturdy toothpicks (see page 156 for Sources). For the Mulled Pineapple Juice: Place allspice, peppercorns, cloves, and cinnamon sticks in a medium saucepan. Stir over medium heat until fragrant, about 2 minutes. Add pineapple juice, rum, brandy, and vanilla bean and seeds and bring to a simmer over medium heat, stirring occasionally. Reduce heat to lowest setting and simmer for 15 minutes. Strain mixture through a fine-mesh sieve into a bowl and discard solids. 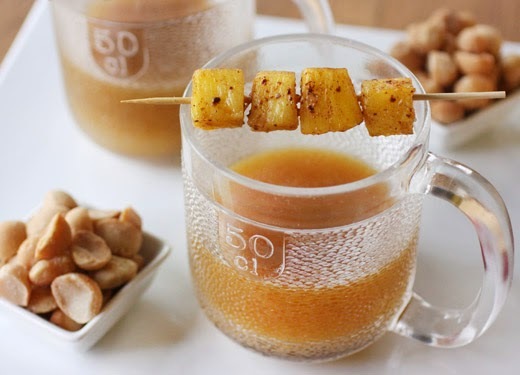 To serve, place one pineapple skewer in each of 4 heat-proof cups. Ladle juice into cups. When it comes to classic recipes, ones that I’ve never tried before, I sometimes get caught up in checking every possible source at my disposal for versions of the recipe in question. It’s a little crazy, but I have to know what all the options are. And, so it was with Linzer Cookies. I kept seeing them here and there and really wanted to try making them this holiday season. With the sugar-dusted tops and jam filling, they make pretty holiday cookies. I had an excellent reason to bake some extra cookies too. The gang behind Austin Bakes organized another bake sale on the weekend following Thanksgiving to benefit recovery efforts after the recent flooding in south Austin. It was a great way to start the holiday baking season. So, my search for recipes started with the original The Barefoot Contessa Cookbook. 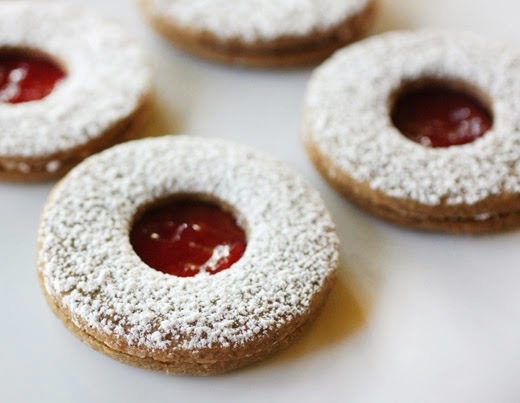 Ina’s Linzer Cookie is a plain, shortbread sandwich cookie with raspberry jam. They’re lovely but a little less traditional. A more traditional option would be made with ground nuts, spices, and maybe citrus zest in the dough. In The Model Bakery Cookbook, Linzer cookies are made with almonds and lemon zest but no spices. Raspberry Linzer Disks from The Modern Baker have almonds, cinnamon, and cloves but no zest. 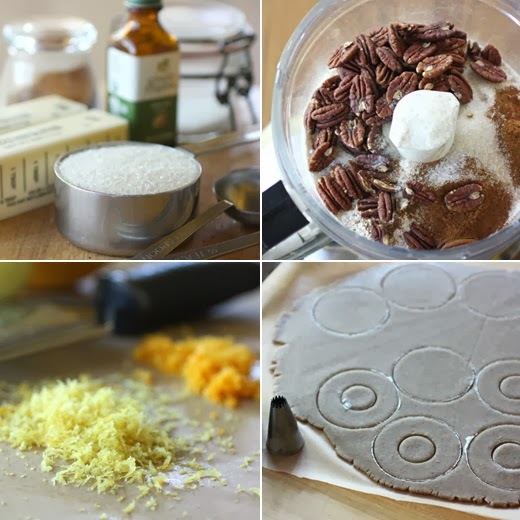 The version found in Martha Stewart’s Cookies includes ground pecans and cinnamon but no citrus zest. And, the version I finally settled on is from Chewy Gooey Crispy Crunchy Melt-in-Your-Mouth Cookies , and it combines all the possible ingredients with cinnamon, cloves, orange zest, and lemon zest. Hazelnuts are suggested for the nuts, but I liked the idea of using pecans and made that one change. 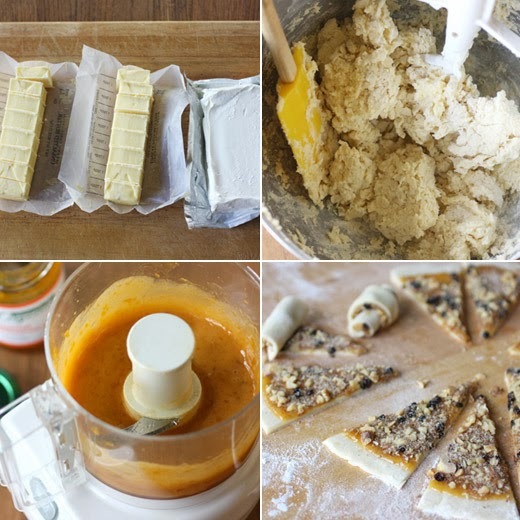 The cookie dough comes together quickly in the food processor. Flour, toasted pecans, granulated sugar, salt, cinnamon, and cloves were pulsed until the nuts were finely ground. 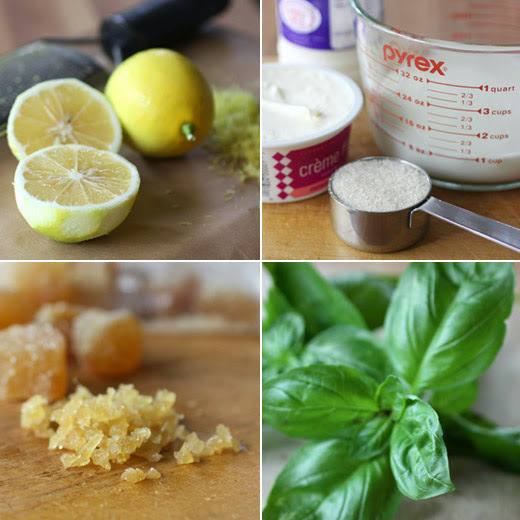 Pieces of butter were added and pulsed until crumbly before almond extract and lemon and orange zests were added and pulsed into the dough. The dough was divided into two parts, each was wrapped in plastic and left in the refrigerator to chill for a few hours. I actually made it in advance and left it in the refrigerator for a couple of days. When ready to bake, each half of dough was rolled out between sheets of parchment paper. Circles were cut, and I used a piping tip to cut smaller circles in half of the cookies for sandwich tops. The dough does become soft and sticky as it’s rolled and cut. While combining and re-rolling dough scraps, I placed the dough in the refrigerator from time to time to let it chill for easier handling. The cut cookies baked for about 14 minutes. When cool, the cookies for the bottoms were topped with raspberry jam that had been strained to remove the seeds. The cookie tops were dusted with confectioners’ sugar before taking their places on top of the jam. I’m easily entertained by learning about different approaches to the same type of cookie, and in the end, I was thrilled with this choice of recipe. All the flavors of spices and citrus were fragrant and lovely. 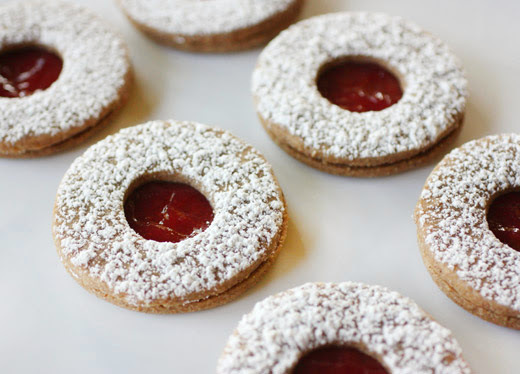 I think Linzer Cookies are now going to have a permanent spot on my holiday cookie baking list. I know I’ve mentioned Meyer lemons a couple of times lately, but I have yet another use of them to show today. This year, my trees gave me enough lemons to have some fun with a few different recipes. This granita from Cowgirl Creamery Cooks , of which I received a review copy, got my attention because I’d never made a granita with dairy in it. 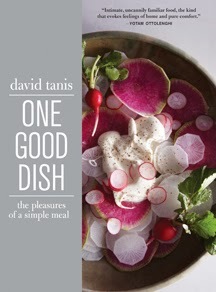 The book is all about using excellent, fresh dairy products and a variety of cheeses in delicious ways. Sue Conley and Peggy Smith have written about their careers in food, starting Tomales Bay Foods in Point Reyes which spotlights products from area dairies and farms, and then becoming cheesemakers themselves. They use organic milk from nearby Straus Family Creamery. It was interesting to learn about how their cheeses are made in comparison to classic cheesemaking techniques. Cowgirl Creamery’s Mt. Tam is started in the same way Gouda is made, but the result is a very different cheese. And, their Red Hawk cheese began as a washed-rind version of Mt. Tam. At the beginning of the book, there are tips for planning a cheese course with suggestions for different flights of cheese. Right away, I wanted to taste what I was reading about and headed to Antonelli’s Cheese Shop with the book in hand. Of course, they had everything I needed for a great cheese tasting including Cowgirl Creamery’s Mt. Tam and Red Hawk and a good goat Gouda for comparison. Beyond cheese courses, the book also includes recipes for Fresh Cheeses, Soft Young Aged Cheeses, Aged Cheeses, Grating Cheeses, Blue Cheeses, and more. The Winter Salad Greens with Persimmon Vinaigrette and Mt. 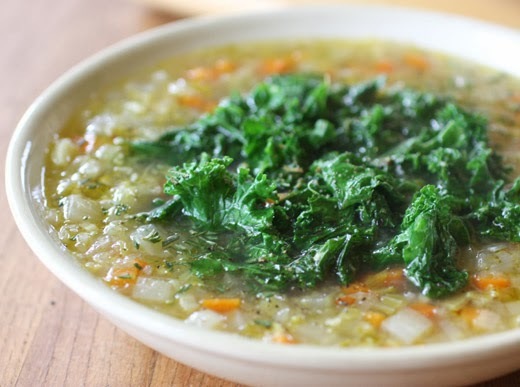 Tam would be perfect right now, and when corn comes back into season, I can’t wait to try the Crookneck Squash and Corn Soup with Humboldt Fog. There are instructions for making your own Fromage Blanc and then suggestions for flavoring it for various spreads. I've already tried the Grilled Mozzarella and Olive Salad Sandwich with a fresh, local mozzarella and can highly recommend it. Next, I wanted to taste the granita with dairy. Both Meyer lemon zest and juice were used. Some candied ginger was finely minced and added to the lemon zest, juice, and some sugar, and the mixture was brought to a simmer for a few minutes. Creme fraiche and milk were added along with two whole basil stems. 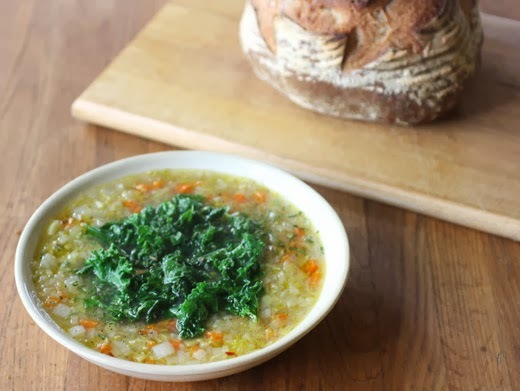 I made this a couple of weeks ago before my basil plants succumbed to the cold weather we’ve had lately, and if you don't have basil on hand, it will still be great without it. The basil steeped in the milk mixture until it was completely cool before it was removed. Then, as with any granita, the liquid was poured into a shallow dish and placed in the freezer. Every 45 minutes or so, the surface was scraped with a fork to form crystals. The flavor was floral, lemony, tart, and rich. The dairy made it more crumbly than icy. 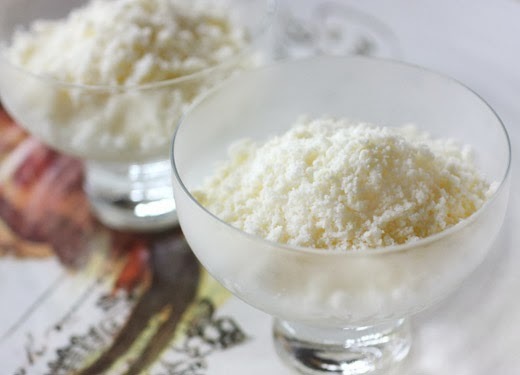 And, I loved the snowy look of the granita scooped into dessert bowls. This book is great inspiration for seeking out small-batch, well-made dairy and cheese products, and it’s the perfect book for anyone who loves cheese. 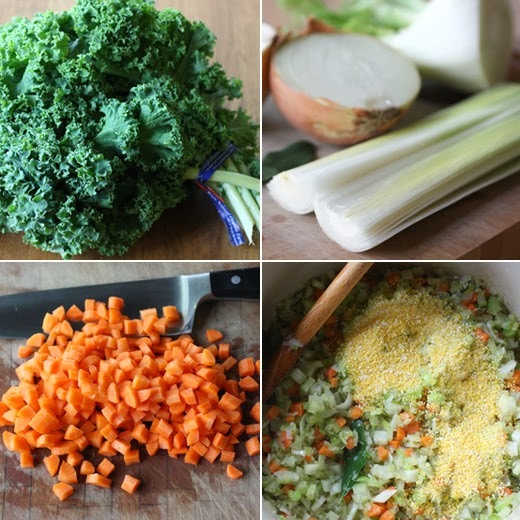 Recipe reprinted with publisher's permission from Cowgirl Creamery Cooks . Tangy, creamy, and yet still light, this granita doesn’t require an ice-cream machine. You just need a stainless-steel pan or liner and a fork to scrape up the ice crystals every hour or so. A glass container will work as well, although liquid freezes faster in stainless steel. A pan that measures 9 by 9 in/23 by 23 cm or 13 by 9 in/33 by 23 cm is large enough so the liquid is relatively shallow. Use Meyer lemons for this if you can get them, but it’s good made with any juicy lemon. Combine the lemon juice, lemon zest, candied ginger, and sugar in a medium saucepan over medium heat. Bring to a simmer and let it cook for about 2 minutes. Taste the liquid. The heat will neutralize the lemon’s acidity so the juice doesn’t taste so puckery and so it doesn’t curdle the milk. Pour in the creme fraiche and milk. Rub the whole basil stems between your hands to release the oils and add them to the mixture. Let steep in the warm liquid until completely cool. Remove the basil from the liquid and discard. Pour the liquid into a shallow stainless-steel pan, cover well with plastic wrap, and place it in the freezer. After 45 minutes to 1 hour, use a fork to scrape up the frozen crystals. Replace the plastic wrap and put the pan back in the freezer. An hour later, scrape again. Do this four times, and then spoon the granita into small bowls to serve or cover well with plastic wrap and store in the freezer. Fluff the granita with a fork just before serving. This delicate frozen dessert is best served the day you make it. 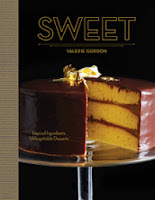 As I started reading a review copy of Sweet by Valerie Gordon of Valerie’s Confections in Los Angeles, the first thing I liked about the book was the one-word chapter titles. Pedestal (celebration desserts), Plate (everyday cakes), Tin (pies and tarts), Box (chocolates and confections), Bowl (desserts to eat with a spoon), Jar (cookies and bars), Larder (jams and marmalades), and Hand (breakfast and snacks to eat on the go). Each title defines the category so well and so simply and directs you to options for every possible occasion. Valerie’s Confections began as a boutique for toffees and chocolates and has grown to offer a wide variety of sweets. I was fascinated with the recipes for cakes from the past. Through research and trial and error, well-loved cakes from Los Angeles bakeries and restaurants that no longer exist have been recreated. Blum’s Coffee Crunch Cake, topped with coffee whipped cream and shards of a coffee-flavored, honeycomb kind of candy, looks delightful, and I have to try The Brown Derby Grapefruit Cake with cream cheese and grapefruit juice frosting during citrus season. The truffles, toffees, and caramels would all make great holiday gifts, and there are tips for packaging them beautifully. In fact, there are helpful tips throughout the book for making your sweets as pretty as they can be including best ways to frost cakes, how to score toffee before it sets, and how to candy rose petals or mint leaves for garnish. And, I was thrilled to learn of Valrhona pearls which are chocolate-coated bits of puffed cereal that dress up the vertical surface of a frosted layer cake. 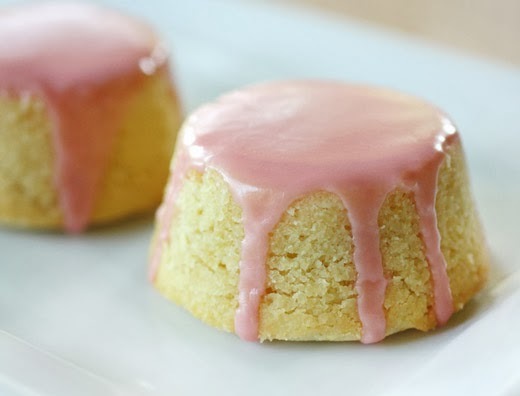 I made several mental notes of fancy cakes I’d like to attempt some day, but the recipes I wanted to try right away were the Salted-Peanut Blondies, the Hazelnut Orange Cakes with Orange Glaze, the Tangerine Sour Cream Pound Cake, and the Meyer Lemon Tea Cakes with Pomegranate Glaze. 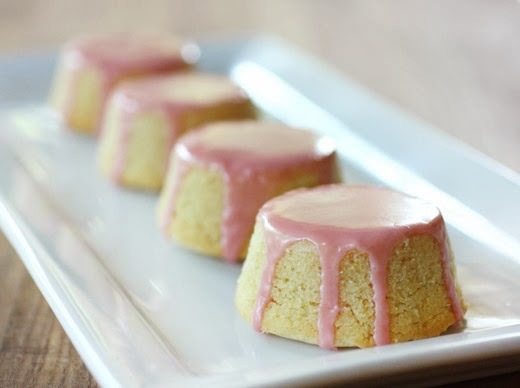 These are pretty, little, lemon, mini cakes with a pink topping from the pomegranate juice in the glaze. In the headnote of this recipe, it’s mentioned that these are popular items in the spring and summer, but I couldn’t wait to make them. 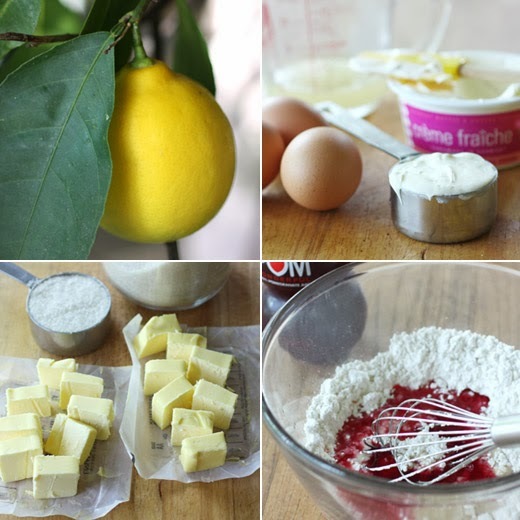 And to me, Meyer lemon and pomegranate are fall ingredients. That’s when the Meyer lemons on my trees ripen and I get very excited to use them in new and different ways. The recipe makes 24 mini cakes, so I cut the quantities in half to make 12. Also, I used a muffin tin rather than mini cake pans. The little cakes are tender-crumbed and delicious with butter, creme fraiche, Meyer lemon zest and juice in the batter, and it’s an easy batter to make. It was scooped into buttered muffin tin cups and baked for about 20 minutes. After cooling, the cakes were dipped into the thin glaze, and they were left to dry. The cakes keep very well, and it’s noted in the book that they freeze well too before being glazed. These tea cakes are perfect for dessert, snacks, or tea time or for whenever you can get Meyer lemons. Next, I need to decide which candies to make for the holidays. It’s going to be fun having one more book on the shelf for sweets for all occasions. Recipe reprinted with publisher’s permission. Excerpted from Sweet by Valerie Gordon (Artisan Books). Copyright © 2013. Photographs by Peden + Munk. We feature this cake every spring and summer at our farmers’ market booths, and time and again I hear the same question, “What is that? !” The jolt of pretty, pastel pink glaze always elicits a response from children and adults alike. Mini-cake pans, with 12 cups each, are available online. 1. Heat the oven to 350°F. Coat 24 large muffin cups or 3-inch mini-cake pans with nonstick baking spray or butter. 2. Sift together the flour, baking powder, and salt into a medium bowl. 3. In the bowl of a stand mixer fitted with the paddle attachment (or in a large bowl, using a handheld mixer), cream the butter and sugar on medium speed until light and fluffy, about 3 minutes. 4. 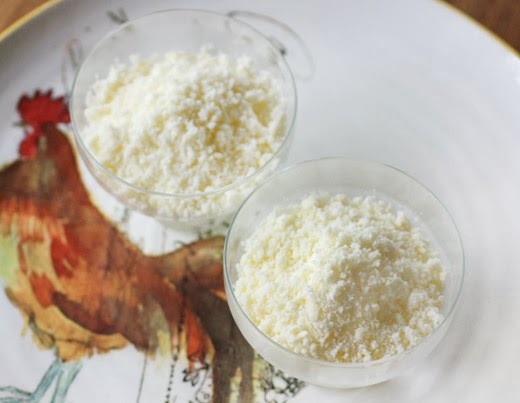 Mix the creme fraiche, eggs, lemon zest, and juice together in a small bowl with a fork or small whisk. With the mixer on medium speed, alternately add the dry and wet ingredients in batches and continue beating until the batter is smooth, occasionally scraping down the sides of the bowl, about 3 minutes. 5. Using a large ice cream scoop or a large spoon, scoop approximately 1/2 cup batter into each prepared muffin or cake cup. Bake for 18 minutes, or until the tops of the cakes appear matte and the shiny center has disappeared; do not bake until the cakes turn golden. Let the cakes cool in the pans for 5 minutes before removing them. Cool the cakes completely on a cooling rack before glazing, about 1 hour. 2. Pour the glaze into a wide shallow bowl. One at a time, pick up each cake, rotate the cake so the top is facing down, and dip it into the glaze. Carefully move the cake in a slow, circular motion so the entire surface is coated with glaze, then shake the cake gently so any excess glaze falls back in the bowl and put on a baking sheet. Put the cakes in a cool, dry area and let stand until the glaze loses its sheen and sets, about 20 minutes. storing: Once the glaze has set, the cakes can be stored in an airtight container for up to 3 days. tip: If you want to freeze some or all of these cakes for future use, freeze them unglazed and then glaze them only after they are completely defrosted. This recipe makes a lot of little cakes—feel free to halve it if you like.